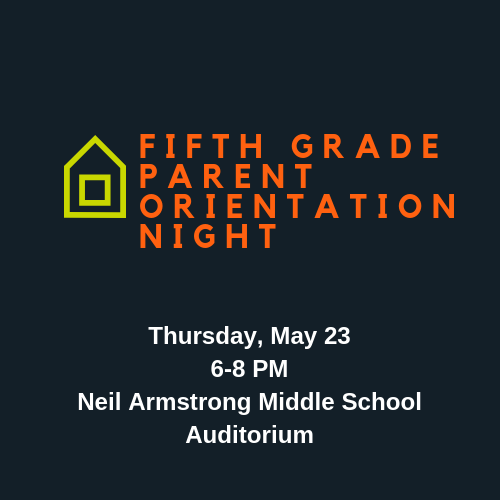 All parents of Fourth Grade students who will attend Neil Armstrong Middle School in the fall as Fifth Graders are invited to attend a Fifth Grade Parent Orientation on Thursday, May 23 from 6 to 8 PM in the NAMS Auditorium. The program will provide parents with an overview of the middle school program at NAMS, including the expectations for their children a middle school students. This program is for parents/guardians only. Students will have the opportunity to tour the school this spring during the school year. If you have questions, please call the NAMS Office at 412-854-8751.